a box of Crayola Crayons– Its for my rainy days..
it was my childhood dream to own a box of crayons.. in India, these Crayola crayons are new comers… our new generations are lucky to have them in their schoolbags,..we were not so lucky then,,,.. all what we got was very weak substitutes of these crayons.. those were made of lots of wax and less colors..
yesterday, I was as excited as a 5 years old would have been.. I got it through Amazon.in… they are also new in India and quickly learning the trick to capture Indian market.. but they have local challenges.. their delivery was fine.. packet came totally intact..
yes, I know it looks childish.. but I thought it would be helpful for those, who wish to buy these big box of Crayola crayons.. and wonder what all colors they will find inside. last week, we had a trip to local diagnostic centre for a routine check up..
ever since I realized that instead of getting bored outside, i should do something. i mean journaling in precise. 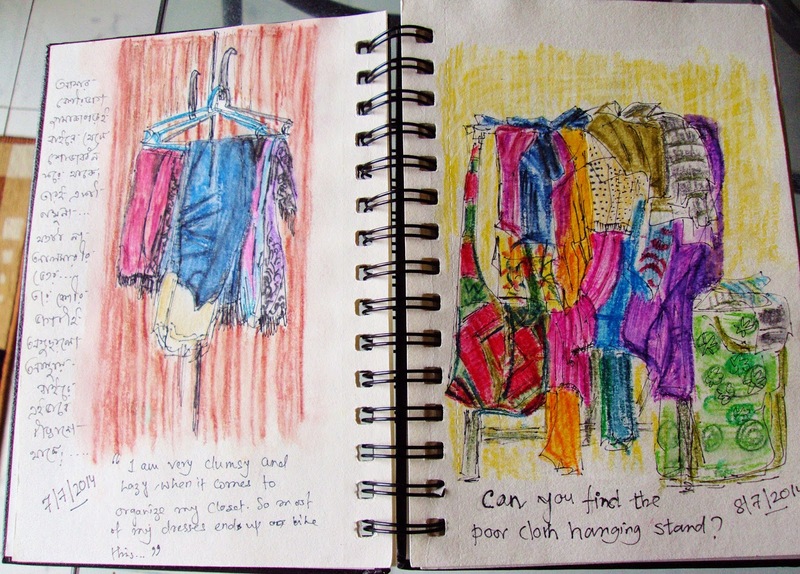 I have started carrying a small notebook with water brush pen and water soluble crayons. . I feel more relaxed.. even if I have to spend more than hours waiting for my turn to meet the doctor..
today I saw this aged gentleman in traditional Indian cloth (Dhoti and Kurta) was waiting outside the ultrasound department.. he was dozing off on a nearby chair…while I was sketching him.. as soon as I finished the sketching.. he left to meet his doctor.. 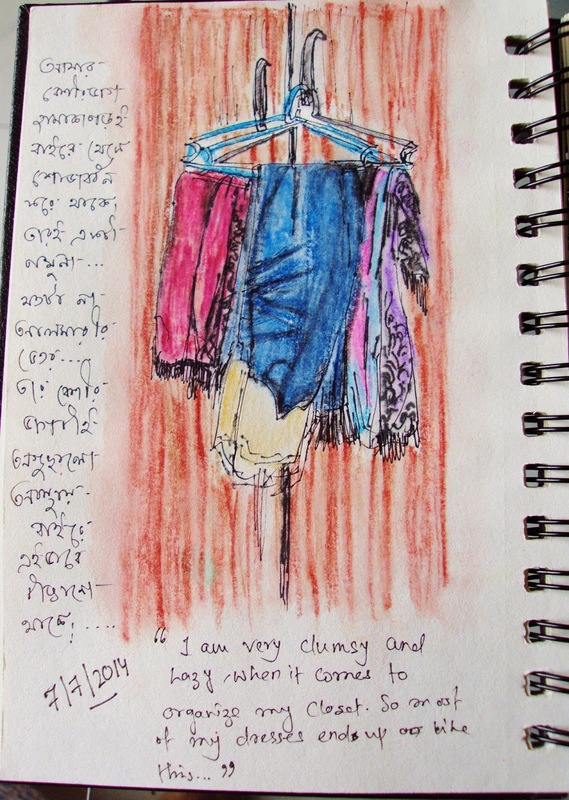 I was lucky indeed to finish the sketch just on time..
in another section of the same centre..
. 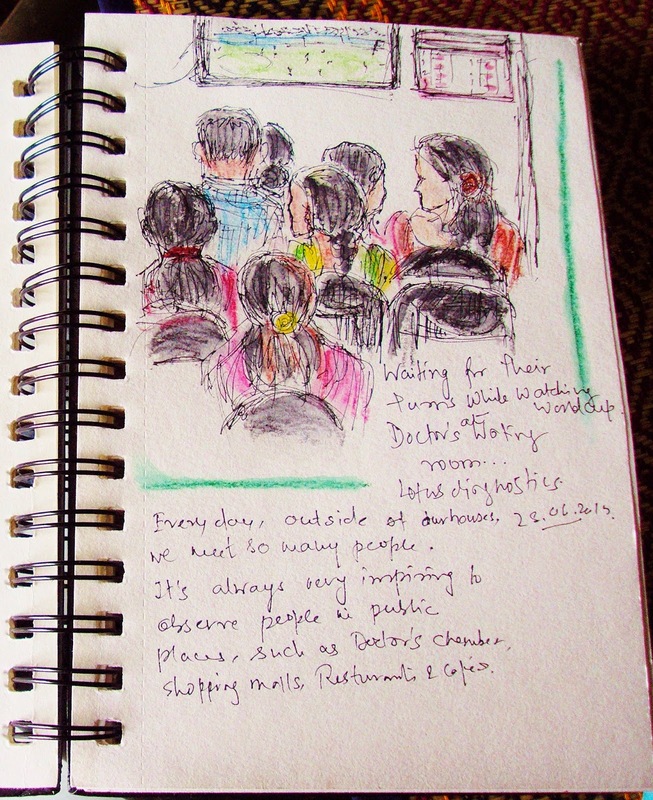 It was world cup time ….. so that’s how people spend their waiting time in diagnostic centres… I am no big football fan.. but sketching people watching football.. and that too while waiting for doctor’s appointment was real fun to do… couldn’t resist…. BTW.. 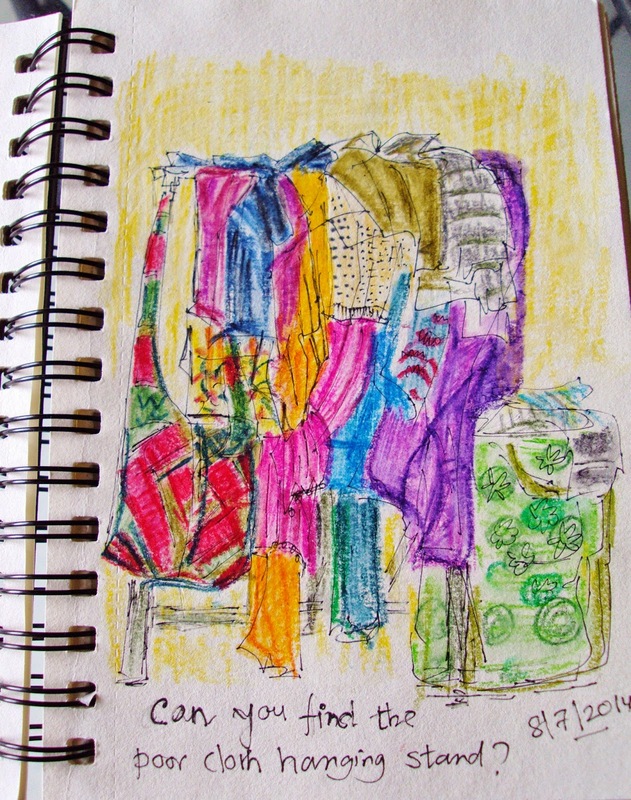 I sketched them with a waterproof 0.2 fine liner and mungyo water soluble crayons – 36 assorted colours. let me show you in details… these hangers were suppose to be inside of the closet.. but I am just fine to see them outside instead…. just next to it.. is a cloth drying stand.. which serve differently now days.. well of course I am too lazy to shift those dried cloths properly pressed and stored inside the wardrobe.. you can even see my hobo bag along with those cloths..
BTW… can you see my stand… its just hidden … well under the cloths…Haah. that’s the question of the day.. can you find my poor steel cloth hanging rack???!! !… lolz.. !! wow… I am so proud of my new height of shamelessness..
A very good Monday afternoon to all. 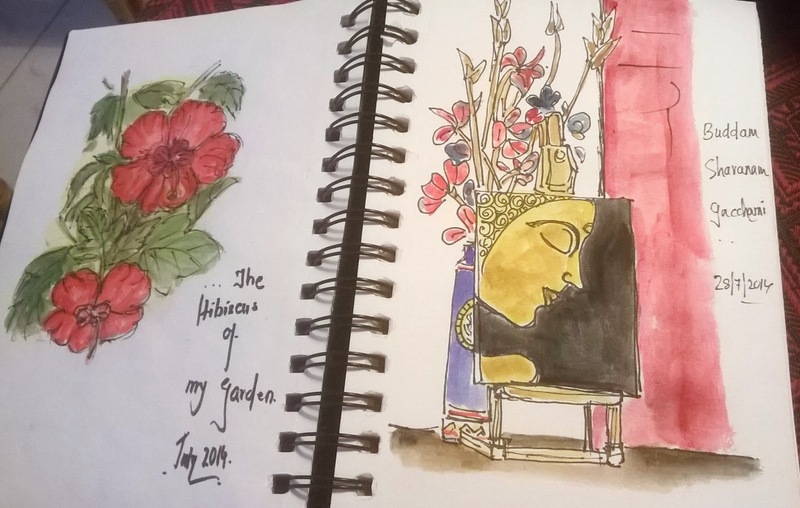 Its all about the mood.. the same painting.. same arrangement, same place.. but its only the way we look at it..
a day well spent.. I must say… feeling very peaceful and happy afterall.